An Oxfordian Journal: What Do the Questions of Climate Change and Shakespearean Authorship Have in Common? What does the question of Shakespearean authorship have in common with the pressing and dangerous issue of man-made climate change? Many upholders of Stratfordian tradition simply have too much to lose. Think of the vehement public statements they have made. Think of the books and articles and blogs they have written. Think of what’s at stake in terms of the tourism industry in and around Stratford upon Avon. Think of the publishing industry aimed at not only the general public but, also, at the academic community. Think of all those textbooks. Think of all the biographies of the Elizabethan and Jacobean ages that will have to be rewritten, to account for the drastic change of personal, political and artistic relationships to “Shakespeare” the real man and to his works! 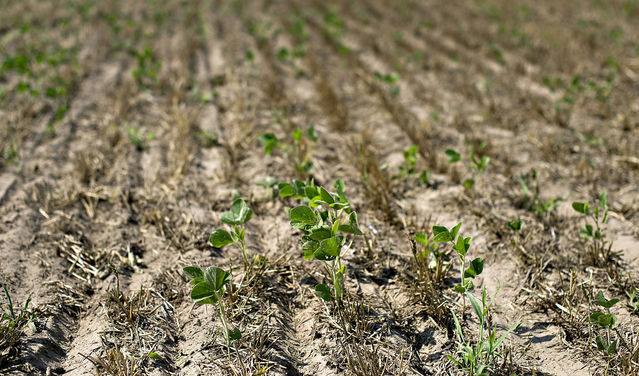 To expect the deniers to reverse themselves is probably asking too much. Reversal will probably have to happen a generation or two from now. I realize that Oxfordians who honestly hold other views of the Sonnets find it difficult if not impossible to change those views. [They will say the same of me!] And I respect that. But I also predict, based on what I know about new materials forthcoming in the next year, that the true meaning of the Sonnets will become increasingly obvious to those who have not become trapped by their own denials – trapped, come to think of it, in the same way Elizabeth became trapped by the Big Lie of her Virgin Queen image, which prevented her from naming an heir and continuing her Tudor dynasty. My problem with the idea that “Shakespeare” might have been someone else was fairly specific. 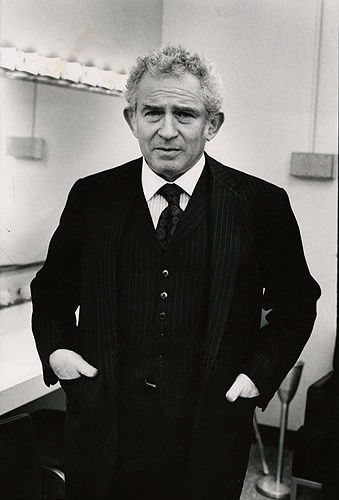 How could some other guy walk around London claiming to be Shakespeare when the real author was right there, writing the plays and working with actors at the playhouse? No, such a scenario was ridiculous. And over the next couple of days, after my writer-actor friend had made his offensive suggestion, I never went beyond that stumbling block of two men simultaneously in the same place claiming to be Shakespeare. 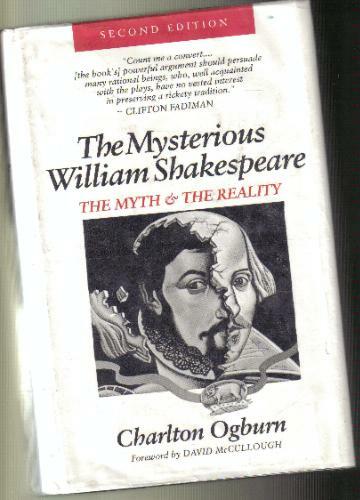 Then in the mail from my friend (Charles Boyle) came copies of pages in The Mysterious William Shakespeare by Charlton Ogburn Jr., published three years earlier in 1984. 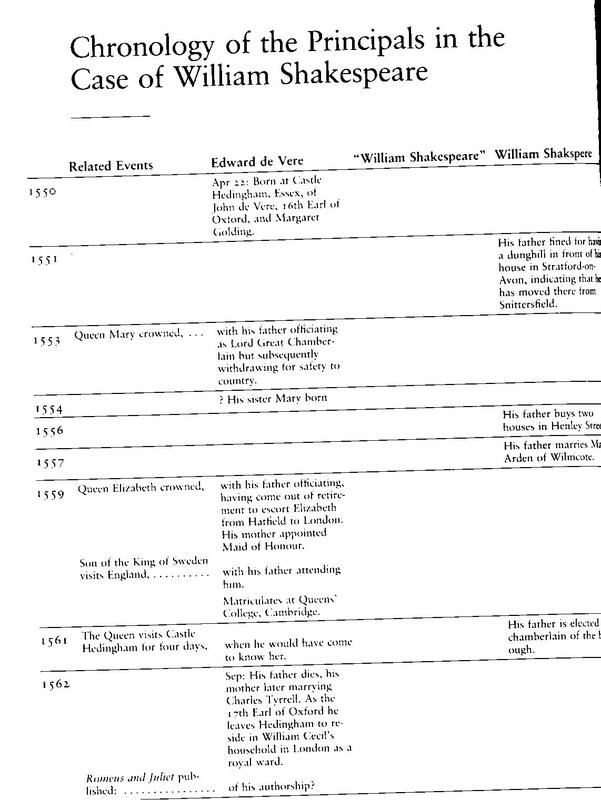 This section, entitled CHRONOLOGY OF THE PRINCIPALS IN THE CASE OF WILLIAM SHAKESPEARE, listed the years (from 1550 onward) in the far-left column and, for each year, presented separate columns for four different categories. The first heading was RELATED EVENTS. The next three were EDWARD DE VERE … “WILLIAM SHAKESPEARE” … WILLIAM SHAKSPERE. The overall idea of “Shakespeare” being someone else was still disturbing to me, but here was a clear and simple answer to my specific problem. Rather than postulate two men in London claiming to be Shakespeare at the same time, this chart presented an entirely different picture. In the first place, it involved not two but three separate entities: (1) the Earl of Oxford, (2) the pen name “Shakespeare” and (3) the fellow Shakspere from Stratford upon Avon. 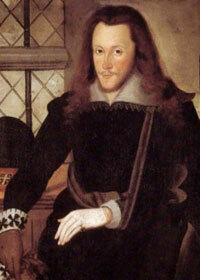 = That the true author, Oxford, had been born in 1550, some fourteen years earlier than the Stratford man. = That Oxford originally created virtually all the relevant works from 1575 to 1590. His plays had been aimed at aristocratic audiences at the private Blackfriars Playhouse, prior to presentation for Queen and court; and in the 1580’s other plays, mostly histories, were performed around the countryside by two troupes of the Queen’s Men, aimed at rousing nationalistic unity in the face of the coming invasion by Spain. = That this roughly fifteen-year period immediately preceded the Stratford man’s career as told by traditional accounts; by 1590 the Earl of Oxford was forty years old, having written all the original versions of his great works. = That Oxford withdrew from public life in 1590 and became a virtual recluse over the next decade, revising works for publication; then he began to use the “Shakespeare” pen name, in 1593. = That during the 1590’s, and even right up to his death in 1604, Oxford continued to revise many works, notably Hamlet, Prince of Denmark. = That upon Oxford’s death in June 1604, the full quarto of Hamlet appeared for the first time, but then all authorized printings of heretofore unpublished “Shakespeare” plays abruptly ceased. The silence continued until an Othello printing in 1622 and then in 1623 the Folio contained thirty-six plays, eighteen of them previously unpublished. Looking at this history, it occurred to me that until the Folio there had been no need for any “conspiracy,” elaborate or otherwise. The man from Stratford never claimed authorship of the works, not during his entire lifetime. When he died, no one outside Stratford even noticed; he left behind no papers claiming his authorship of anything. “My name be buried where my body is,” the true author wrote in Sonnet 72. “I, once gone, to all the world must die,” he wrote in Sonnet 81. 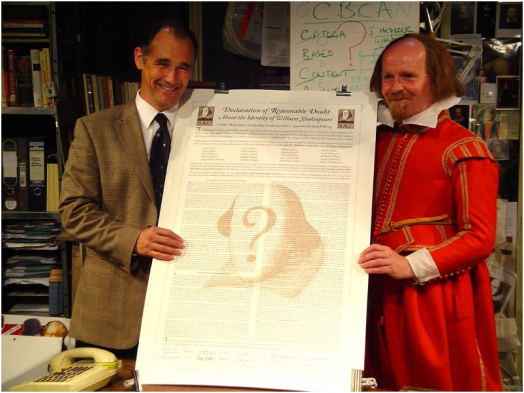 An Oxfordian Journal: Wasn’t Shakespeare a “Conspiracy Theorist”? I keep seeing blogs that accuse anyone questioning the traditional biography of Shakespeare as a “conspiracy theorist.” I know what they mean. I felt the same way back in 1987 when it was suggested to me that the guy from Stratford didn’t really write the great poems, plays and sonnets. I didn’t much like that suggestion. 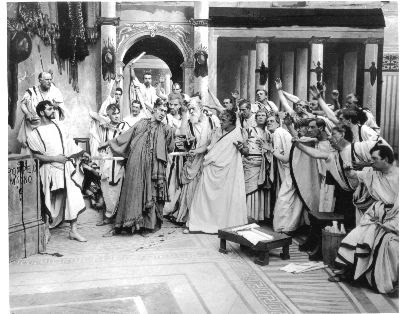 Conspirators arrive at the Senate House, having plotted to kill Caesar. Probably the first thought that came to mind was that the whole concept was simply too staggering, too unbelievable, too overwhelming. I had gone through four years of college (in English and Theater Arts) and had never heard the slightest hint of any problem with the Stratfordian authorship view. This was probably the greatest writer who ever lived – how could it be possible that he had not been the man who everybody thinks he was? I’m not sure if I used the word “conspiracy” at the time; but I probably did consider (loosely) that such a cover-up or hoax would have taken what my dictionary calls a “treacherous or surreptitious plan formulated in secret by two or more persons.” If there had been such a plan to disguise the true author of the “Shakespeare” works and attribute them to someone else, it would have involved the creation of the First Folio of Shakesepeare plays — published in 1623, long after Oxford and Shakspere had died respectively in 1604 and 1616. (Prior to 1623 there is no discernible linkage between “Shakespeare” and Shakspere.) That publication would have indeed required at least several individuals engaged in a surreptitious plot. As I now ponder this subject, it occurs to me that regardless of his identity Shakespeare was a “conspiracy theorist” – both as a dramatist and as an Elizabethan. 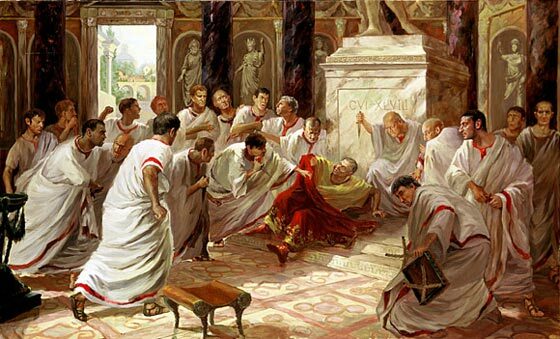 It’s a given that many of his plays involve conspiracies, the most famous being the plot to kill Julius Caesar. Then, of course, there’s the plot by Macbeth and his wife to murder King Duncan, not to mention Iago’s plot to entrap Cassio with Roderigo’s help. Plots of one kind or another abound in the plays, even in the comedies. And why not? During the Elizabethan reign itself there were always conspiracies against the Queen’s life. Three of the most famous ones revolved around Catholic attempts to kill Elizabeth and replace her with Mary Queen of Scots – the Ridolfi Plot that surfaced in 1571, the Throgmorton Plot of 1583 and the Babington Plot of 1586. The so-called Essex Rebellion of 1601 involved a plot to remove the Queen’s closest advisors, notably Robert Cecil; and when James became king in 1603 there was the Bye Plot and then the Gunpowder Plot, for starters. For court poets and dramatists of the time, the very act of writing was a kind of conspiracy. The anonymous author of The Art of English Poesie (1589) wrote: “I know very many notable Gentlemen in the Court that have written commendably, and suppressed it again, or else suffered it to be published without their own names to it.” In other words, at times they used someone else’s name or some made-up pen name. Who was that infamous author in 1588-89 calling himself Martin Marprelate? Here was an obvious pen name, sometimes printed as Mar-prelate, indicating an author or authors intent upon “marring the prelates” of the Anglican Church; and no one has ever learned his identity for sure. Whoever that writer was, it’s unlikely he could have acted entirely alone. Are there political conspiracies even now? Of course – just about every day. And even as I write this, I’m getting an alert from the New York Times that “the most powerful men at Penn State failed to take any steps for 14 years to protect the children” victimized by Jerry Sandusky. Wasn’t that some kind of conspiracy? In upcoming blogs I’ll have comments about the Shakespearean authorship “conspiracy” in particular. I wonder how many people feel that way and how many become writers because of that feeling. I believe it was profoundly true of Edward de Vere, Earl of Oxford, who lived so much of his life in the shadows offstage, so to speak. Writing, along with the act of publishing or putting on a play, was a way of stepping forth from the wings. This is one reason “Shakespeare” speaks to a universal audience. Take a look at Oxford’s life and then think about so many plays that must have come from his need to communicate his experience. Quite often, more than we may realize, he was communicating that personal experience to Queen Elizabeth. It seems that if something happened in his life and made him have certain thoughts and/or feelings, it didn’t exist unless he shared it with her … through poetry, and mostly through characters on the stage of the royal court, before they were brought alive in the public playhouse. If the Queen did not know about his joys and pains, they began to wither within and become worse than lost … the proverbial sound of a tree falling in the forest, a sound whose vibrations have no ear to receive them, no one to hear.